Dear Students, the bandwidth of getting through competitive exams oscillates from travailing all day and night to filling up the crevices due to which you have had your chips in days gone by. And an endeavor to achieve something great is always bitty if not escorted by some wonderful sources to add up zest to your monotonous preparations. 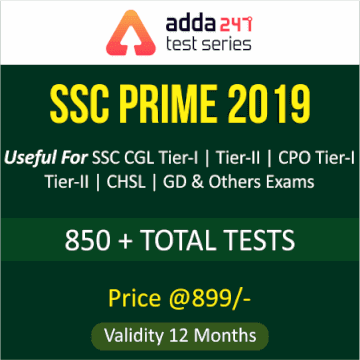 So, we, team Adda247, bring to you all the PRIME Packages that incorporates the test series for all the upcoming banking, SSC and teaching examinations. BANK PRIME package incorporates more than 800 mocks tests and is available at a price of Rs. 999 for 9 months and Rs. 1199 for 15 months. SSC PRIME package incorporates more than 850 mock tests and is available at a price of Rs. 899 for 12 months. INSURANCE PRIME package incorporates more than 100 mocks tests at a price of 499 for 12 months. 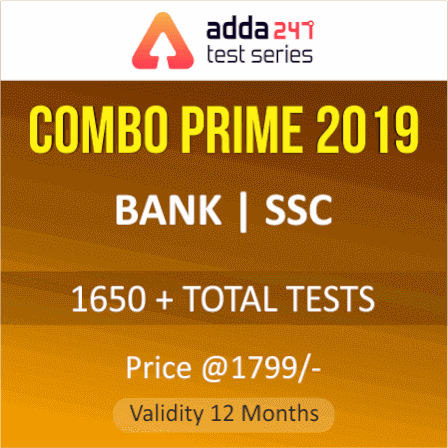 COMBO (BANK+SSC) PRIME incorporates more than 1650 mock tests and is available at a price of Rs. 1799 for 12 months. While most of you are showing great enthusiasm to grab the Prime Packages with the utmost dispatch, some are still not in the know about their advantages. So, here are the 5 points which discuss the advantages of Prime Packages launched by Adda247 for Bank, SSC and Teaching Exams. Most of the government job aspirants are preparing for more than just one job and thus appear for a significant number of exams that are conducted throughout the year. With Prime offers, one gets the test series for all the major examinations under a particular sector or more than a single sector (with Combo Package). Also, if you buy the test series for all the different examinations separately, it costs you much more than a PRIME Package. That way, you save a lot of money. The mocks of all the exams in the package will be updated as soon as the official notification for the recruitment process is out in the year 2019. The mocks will also be updated as per the new pattern (if a change is introduced) of 2019 exams. So, you get the latest pattern mocks for all the exams you will be appearing for. Students, what plays an important role in one’s stellar performance in any competitive examination is round-the-clock practice and it is a requisite to crack any competitive exam. With Prime Packages, you get enormous practice material for all the government job competitive exams. You must always test where you actually stand in the toilsome competition so you can work on the shortcomings that may cost you a government job. Attempt hundreds of mocks available in the Prime Packages and know your point on the scale that takes in lakhs of other aspirants on it. So students, do not waste any time and get your Prime Package while the going is good. All the best for the upcoming competitive exams.